Freediving Gold Coast Club Dynamic Mini Competition on the 23/6/19. BOOK HERE. Helping freedivers set personal challenges in their freediving training to motivate themselves to test their own limits. 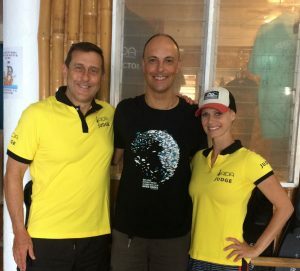 To help freedivers set regular goals, evaluate the effectiveness of their training, and keep on track in their freediving training..
Having fun and meeting other athletes from the growing world freediving community. Helping freedivers learn the international competition rules of AIDA. Providing valuable competition experience for freedivers who wish to challenge themselves against other freedivers in Australia and overseas. Finding naturally talented freedivers, as part of our talent identification and education program, who with appropriate training, might become the next Australian Champion to challenge the best freedivers in the world. 8th to 11th March 2019 South Australian Freediving Challenge 2019 (Pool; Adelaide Australia). 15th to 18th March 2018 Freediving New Zealand Depth Nationals (Depth; New Zealand). 29th April 2018 Freedive Panglao Static Challenge (Pool; Panglao, Philippines). 11th to 13th May 2018 Australian Pool National Championships in (Pool; Sydney Australia). 8th to 10th June 2018 Asian Freediving Cup (Depth; Panglao, Philippines). 9th to 11th June 2018 Wellington Winter Championships (Pool; Wellington, New Zealand). 27th to 28th July Freedive Panglao Mini-Competition (Depth; Panglao, Philippines). 14th to 17th September 2018 Freediving New Zealand Pool Nationals (Pool; Queenstown, New Zealand). 15th to 17th September 2018 Freedive Panglao Japanese Cup (Depth; Panglao, Philippines). 20th to 23rd September 2018 Apnea Association of Singapore Depth Competition 2018 (Depth; Tulamben, Bali, Indonesia). 12 to 14th October 2018 Indonesia Apnea Competition (Pool; Tangerang, Indonesia). 14th October 2018 Hong Kong Freediving Competition (Pool ; Hong Kong). 3rd to 8th November 2018 Sabang International Freediving Competition 2018 (Depth, Weh Island, Sabang, Indonesia) NB Cost of competition is free so get in quick to enter. 7th December 2018 Dynamic December (Pool, Adelaide Australia). Cost $25 Start 6pm. Organiser: Craig de Vos. Please note that the dates above are mainly for 2018 and the dates for 2019 have not been finalised yet but from experience most of the above freediving competitions are held at similar times each year. Please go to the AIDA International website and Event Calendar to check and confirm dates for freediving competitions in 2019. We will update this list with correct information and dates as it becomes available.